The SAMR theory of learning allows more technology to be integrated into the classroom. As educators it is important that we are constantly meeting the needs of all our students and driving student instruction using data. Technology has helped make this process easier and possible! As a fifth grade classroom teacher, I feel strongly drawn the modification level that is discussed in this theory. It is designed to enhance the traditional classroom so that more technology can be used to meet student needs. I find that my students know more about technology than I do myself. It has been easy to incorporate it into the classroom. The modification level allows for significant task redesign within classroom activities and projects. Within my current classroom I have . . .
Mrs. Sandler’s 5th grade students showing off their A+ spelling test! In order to meet the needs of all of these students it is important that I have the technology and flexibility to be able to modify assignments. Technology begins to play a big role in the aid of modification in order to meet the diverse needs of all students in today’s world. Below are some of the ways that I am currently using technology to help personalize learning experiences. Kathy Schrock published some framework questions in her article entitled Guide to Everything SAMR and Blooms. These questions play an important role when thinking about how to modify student work to best meet their needs. Does this modification fundamentally depend on new technology? How does this modification contribute to my design? These questions help support my love and thoughts about Project Based Learning (PBL). In PBL learning all students start with a real world question, create a project that will solve the question that integrates curriculum and standards, and then present their project to their classmates and often times community members. Below is one of my recent attempts at a PBL as we were learning about land forms in our science curriculum. Question: How can I as an engineer create a light rail system that runs from Idaho Springs to Aurora Colorado taking into account the land forms along the way? Students had to take what they had learned about land forms, create a map showing the route for their light rail system, identify the land forms on their map, and create a presentation to justify why they chose to build their light rail route. Taking into account the modification level of SAMR within these PBL project students could modify their project using technology. Several students created an interactive google slideshow for their presentation, one group chose to make an interactive map using google draw, and other students chose to modify their route by using google pictures. It was amazing seeing how students adjusted their own projects using technology. One challenge I see in many schools in my district (Aurora Public Schools) is that teachers lack technology in their classroom. I am lucky enough to have a Chrome book for each student in my classroom but not every teacher is as lucky as I am. I wonder how the modification process can take place in a classroom where little technology is available to students? Should they be allowed to bring devices from home? How does the outcome of their project change without technology available? It is important for everyone to consider the current state of our education budget and consider how we can personalize learning with and without technology. One question I challenge myself to think about as I move forward with the SAMR model of learning is how can I teach students to drive their own learning and begin to use technology to modify their own work? So much of what I do is modify students work for them but I would love for students to reach a point where they are able to recognize their need for personalized learning and make modifications for themselves. As an educator, it is my job to teach students the skills they need to become contributing members of society. As they go out into the workforce they will need to be able to adjust their own learning and work based on their needs. I strive to teach them these important skills in 5th grade. I am hopeful that I can use SAMR to continue to use technology to design my instruction and create personalized learning experiences for my students. As I start to incorporate more personalized learning experiences with more technology I know that students will become more engaged in their learning. Prev Post: Does Anyone Have Privacy Online? I think ‘modification’ is super important for your students. At this grade level, I can imagine exploration, agency, initiative, and project based learning being so motivating. It is unfortunate that budgets and approvals can be limiting in terms of tech. Also many students at this grade level may be below the 13 year age requirement for accounts. There is so much freeware and ‘open’ ed resources out there for students to explore, but it’s just out of reach. It seems like there is a niche here to be explored for this grade level in terms of OER. I also wonder how many of these sties that are free are blocked by my school district? It sounds like you are doing an amazing job applying a high level of SAMR, the Modification level, with limited resources. I loved the mapping project example. That would really bring alive the project for your students; especially the group that made an interactive google map. It seems like there might be several ways you could apply the Modification level for your class, without extra funding. For example, if you had a digital camera, you could have the students create video presentations, and then post the work to your own site, or to youtube. The students would be able to access it online from the public library, or from your own laptop. In your case, they already have that ability since they have their own laptops. In fact, there might be a camera on their laptops. Funding is a core issue in public K-12 schools, especially in the younger grade levels. It sounds like you are doing a great job, especially considering how diverse your class is. Awesome post Allie – applying SAMR in a really thoughtful way. Your classroom sounds amazing, with so many languages and cultures and abilities – plus all those Chromebooks to work with. I wanna come visit you! 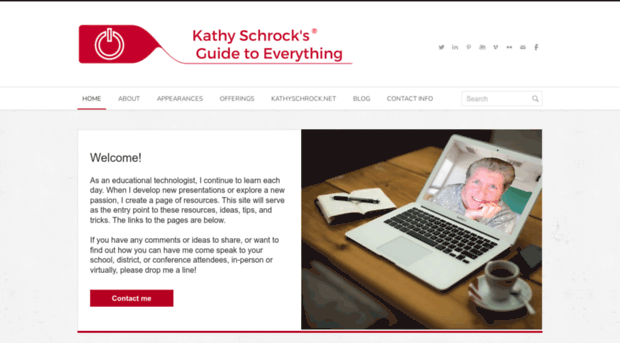 Thanks for the link to Kathy Schock’s site. She is a great compiler and synthesizer of ideas and resources. The light-rail example – sounds like a cool PBL case to get the kids really thinking and sharing ideas. I hope you can share your enthusiasm with other teacher colleagues; good luck cultivating a culture that respects the students and helps them stretch and learn!